Arrival at Komodo Airport in Labuan Bajo west Flores, meeting service with our representative, and transfer to your Hotel, check in at the hotel, after lunch transfer to the harbor to take boat trip to Bidadari island for snorkeling, relaxing or swimming, it just take 30 minutes from Labuan Bajo. Afternoon late sail back to the GOLO HILL TOP OR BINTANG FLORES to have dinner and overnight. Morning after breakfast at your hotel transfer to the pier of Labuan bajo to visit the island of Komodo Dragons Rinca,after 2 1/2 hours sailing start your trekking walking through the typical dry forest to explore the Island of Komodo dragon, you will find not just the Dragons but also many wild animals like, deer, wild buffalo, long-tailed macaque and wild pig also numerous of birds. 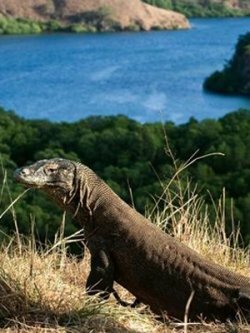 Keep your eyes look up as sometime you will find the young Komodo dragons on the trees.. Return to boat and proceed to Kalong Island in Komodo Island to see the fling foxes set out from the mangrove tree at 06 - 07 pm .Lunch, Dinner and overnight on board. Early morning start your trekking on Komodo ,walking through the typical dry forest to explore the Island of Komodo dragon, you will find many wild animals like, deers and wild pigs and also numerous of birds such as leSser-sulphur-crested-cockatoo,collared kingfisher,etc. A local ranger will lead you through this natural preservation, Return to boat and proceed to Pink beach for swimming and snorkeling in unspoilt coral reef amongst colorful tropical fish. Sail toward MANTA POINT to exploring Huge Mantas by snorkeling even watching from your boat trip. But we do not guarantee these objects, depending on the weather good or not unch on board and afternoon back To Labuan Bajo.Overnight at New GOLO HILL TOP or BINTANG FLORES Hotel. After breakfast, a morning visit to the Batu Cermin/Mirror cave before taking you to the airport for flight to Home. Snorkeling gear, Conservation fund at Komodo National Park.